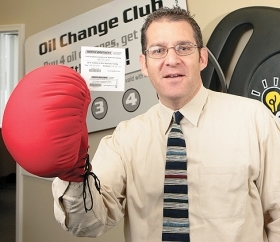 Dealer Concepts' Andy Wolfe shows a Punch-a-Deal key service tag designed for a Ford store. "It's meant to generate repeat business," he says. As new-vehicle sales remain depressed, auto dealers are placing renewed emphasis on promoting customer loyalty. "Customer retention is the next big thing," says Andy Wolfe, managing partner of Dealer Concepts LLC. The suburban Detroit company helps dealers introduce programs that reward customers for repeat business. Dealer Concepts works with automakers such as Chrysler and Volkswagen as well as "thousands" of dealers, Wolfe says. Volkswagen of America COO Mark Barnes says his company is running a Dealer Concepts program called Owner Loyalty Rewards. The pilot program involves a small number of dealers in California. "From a loyalty standpoint, it's extremely important we do what we can to obtain and retain customers," Barnes told Automotive News. Chrysler LLC has a similar pilot program in the Southwest region, said Chrysler spokesman Stuart Schorr. Wolfe's biggest seller is a punch-card promotion called Punch-a-Deal. It's similar to frequent-customer cards issued by coffee-shop chains. The dealership program enables customers who buy a certain number of oil changes to get the next one free, Wolfe says. The prospect of a free oil change keeps service customers coming back, Wolfe says. That gives the dealership an opportunity to sell more parts and service work, he says. "The oil change is the least common denominator," Wolfe says. "When customers come in, they need tires, they need brakes. It's meant to generate repeat business and to keep you from going to Jiffy Lube." About 2,000 Chrysler dealers use Punch-a-Deal, Schorr says. Last year, Dealer Concepts introduced Owner Loyalty Rewards. The program allows for a greater variety of customer incentives, such as points that can be cashed in for dealership products and services, Wolfe says. Like many supermarket chains, the rewards program uses a laminated key chain tag with a bar code strip. Dealerships get a bar code reader that enables them to scan the tag every time a customer makes a transaction. Dealerships also can add a bar code to direct-mail pieces, coupons and advertising in print media, Wolfe adds. According to the most recent Customer Retention Study by J.D. Power and Associates, Chrysler and VW both have work to do to improve customer loyalty. VW keeps just 39.7 percent of its U.S. customers, compared with the industry average of 48.0 percent, Power says. The study says retention occurs when a customer replaces a vehicle he or she bought new with a new vehicle of the same brand. VW has several projects aimed at boosting customer loyalty and building aftersales business. Ron Stach, VW's general manager of fixed operations, says a program called Target and Retain Aftersales Customers divides customers into three segments: loyal, semiloyal and inactive. To increase after-warranty business, a VW program offers incentives to dealerships to buy factory parts and resell them to aftermarket service providers, Stach says. Depending on wholesale volume, dealerships can earn an incentive equal to 2 to 3 percent of sales. In a yearlong pilot program that ended late last year, VW says, participating dealerships earned an average of about $1,100 a month in incentives. According to the Power study, Chrysler brands also had low retention rates: Jeep at 42.8 percent, Dodge at 39.7 percent and Chrysler at 32.8 percent. The study, released last month, concludes that "customer retention will become even more critical to automakers in the coming year."